Harry Kane became Tottenham's joint fifth highest scorer as he helped his side earn a 2-1 Premier League victory over Brighton & Hove Albion on Saturday. Harry Kane became Tottenham’s joint fifth highest scorer as he helped his side earn a 2-1 Premier League victory over Brighton & Hove Albion on Saturday. Kane moved level with Jermain Defoe on 143 goals for the London club as Tottenham put behind them successive defeats by Watford, Liverpool and Inter Milan in all competitions to climb to fifth in the Premier League table. Kane opened the scoring from the penalty spot on 41 minutes after Glenn Murray handled in the box and the England striker fired the spot-kick into the corner of the net. 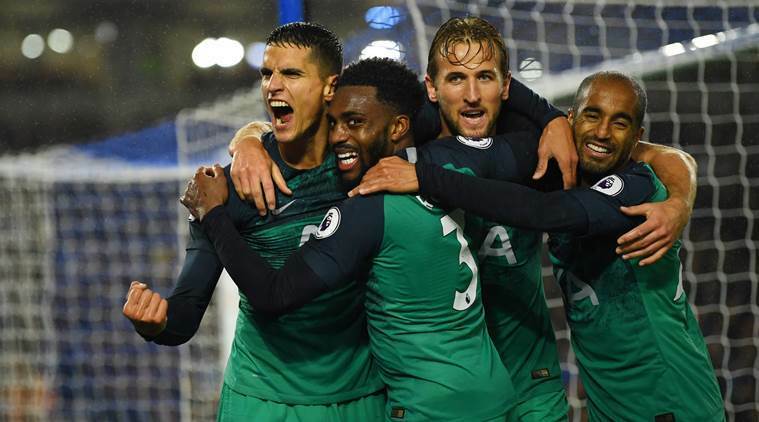 Brighton had a goal ruled out for offside and substitute Erik Lamela added Tottenham’s second with a neat finish on 76 minutes. Anthony Knockaert’s stoppage-time effort was a late consolation for the hosts. Tottenham manager Mauricio Pochettino was thrilled with the attitude shown by his players. “Everyone can understand what we are feeling now. The spirit we showed was the most important thing,” Pochettino told BT Sport. “We played some very good football and apart from the last minute which was a little bit embarrassing with the late goal, the performance was great. Kane was also happy to see his side emerge from the mini slump and hopes they can now maintain their position near the top of the table. “Today was about mentality, getting around the pitch, pressing high and harder and I think we did that.” Kane told the BBC. Brighton manager Chris Hughton felt his team created enough chances to take something from the game but praised the clinical finishing from the Tottenham forward line. “On the balance of play, it got a little bit frantic in the last period where they had a few chances, I think we had as many good opportunities as they did,” Hughton told BT Sport. “But with the quality they have, they can be clinical with theirs. I think they showed their quality with the second goal in a high press from us trying to get back in the game.